M(i)s Ch(i)ef™: Snap, Crackle and Pop! Crispy skin is one of those amazing inventions that features in kitchens all over the globe in different guises. My favourite is pork crackling! To me, the test of the oven of my rentals is the crackling test. If I could make perfect pork crackling I was on to a winner! I still remember the disappointment of my last rental place with the elements on the bottom of the oven making crunchy crackling almost impossible. 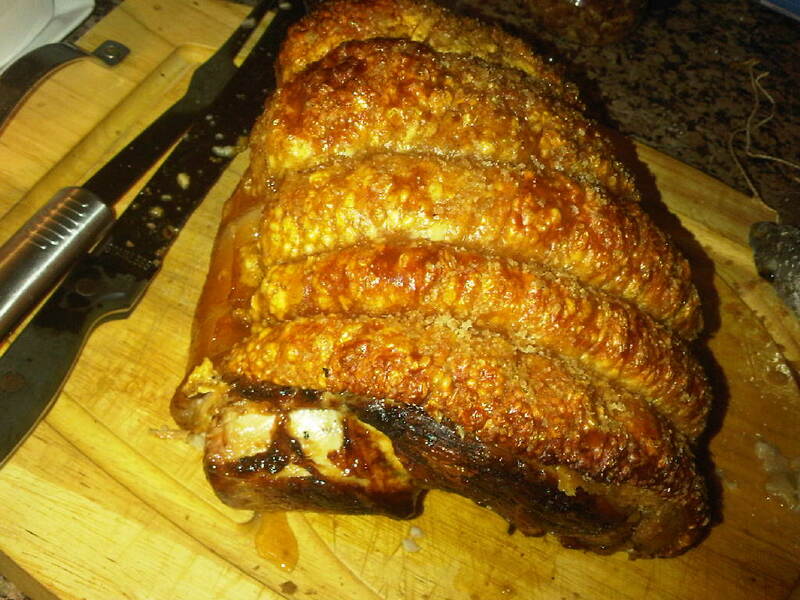 When making roast pork for friends I never like to promise crackling just in case it doesn't quite deliver, but even though I say so myself, I'm getting quite consistent at putting up a great attempt each time. I've picked up a few tips along the way that have helped which hopefully will help you succeed with a fantastic snap, crackle and pop! Preheat the oven really high. The recipe might say 200 but I crank it up to the highest setting! I dry the skin really thoroughly and score through just the top layer (not through the fat makes better crackling, I've heard). Some supermarket porks are already scored but sometimes not enough! Be generous with the oil. I don't measure out, I just pour and generous amount into my hand and rub it all over the skin. Be extra generous with the salt. I used to salt my pork on the baking tray before putting it in the oven, but I put so much salt on it, it can make anything else really salty! Now, I prepare my pork on a plate with salt covering the whole skin and rubbed in. I then transfer it to the baking tray leaving the excess salt out! After preheating the oven on really high, don't turn it down for 15 - 20 mins. I really give it a good chance in the first few moments of cooking so at least I am confident of how it's going to go. Turn the pork when cooking. I try to turn it a few times so all surfaces get a go of the hotter sources. Don't fill the baking tray too much with the roast veg. Anything that will make the roast start to stew will impact on the overall crispiness of the crackling, so if you like using the pan juices and fat from the meat for your roast veg, give the pork it's space! Finally, don't put the crackling on top of the meat to be doused by gravy. I set mine to the side and on top of any juices and sauce!